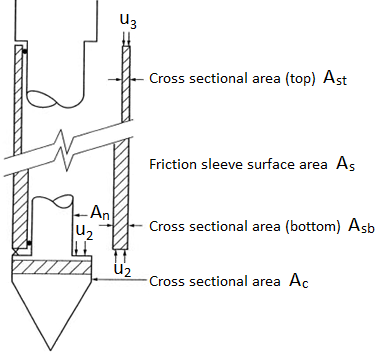 This coeficient α [-] represents the net area ratio which is determined from from calibration measurement at laboratory (the effort to eliminate the adverse effects of friction sleeve and unequal cone tip). Typical values of this coefficient are in the range from 0.7 to 0.85. EN ISO 22476-1: Geotechnical investigation and testing - Field testing. Part 1: Electrical cone and piezocone penetration test, 2013. EN ISO 22476-12: Geotechnical investigation and testing - Field testing. Part 12: Mechanical cone penetration test (CPTM), 2009. Robertson, P. K.: Interpretation of Cone Penetration Tests – a unified approach. Canadian Geotechnical Journal, 2009, No. 46, pp. 1337 – 1355. Robertson, P. K. and Cabal, K. L.: Guide to Cone Penetration Testing for Geotechnical Engineering. Gregg Drilling & Testing, Inc., USA, 6th edition, 2014, 133 p.